Hosting an event is an opportunity to spread the word about your business. Event is a broad definition. There are several events you could host. The type of event you should host depends on who your customer is and what goal you’re trying to accomplish. Your event could be social, such as a networking meetup; an informative insight into your business and the products or services you provide or a sale or special promotion. If you’ve just opened a great new restaurant and want everyone to check it out, you’d host a Grand Opening Celebration. Hosting a Grand Opening event helps increase awareness of your new business in the community and a foundation to build a large customer base. So, once you’ve decided to host your first event, how do you get the word out about it? 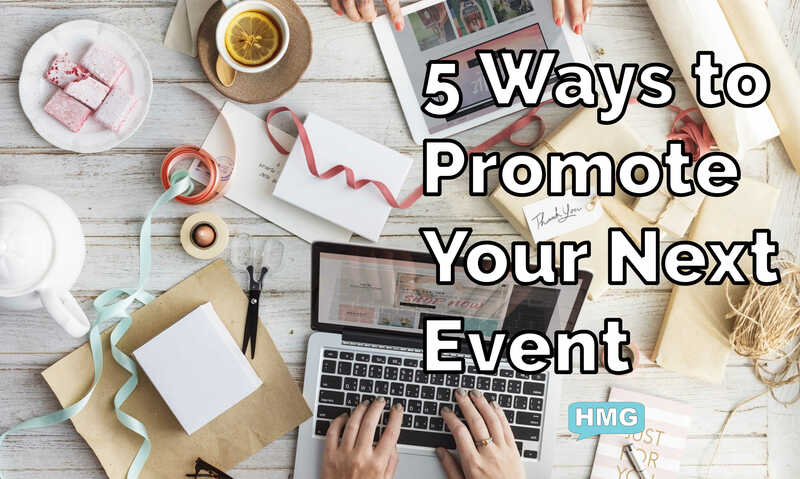 Let’s talk about these 5 ways you can promote your next event. The first place you want to share your event is on your website. Publish a new blog post about your event and include all of the details. Consider adding a downloadable PDF flyer of your event and a calendar invite so website visitors can save the event to their calendar of choice. Once you’ve published your even on your website, share it to your social media networks. If you’ve connected your website’s RSS feed to an automation module such as IF or Hootsuite and connected your business social media profiles, this can be done automatically (see our documentation here and here). To continue promoting your event, share your event at least once per week on your business profiles and any local business groups you are a member of and from your personal accounts. Also consider adding your event to Facebook events and inviting the users who like your business page. Eventbrite is an excellent platform for promoting events, both free events and events with a registration fee. Eventbrite does not charge any fees for free events, paid events registrations have a fee based on the Organizer Plan you’ve signed up for. The purpose of publishing your event on Eventbrite is exposure to the traffic they’ve build. Eventbrite has done an excellent job of building a loyal user base who are looking for local events of all types. Building an email list is today’s equivalent of a building your rolodex before electronic communication became the standard. You should a general mailing list that includes your customers, clients and strongest connections. When you announce that you’re hosting an event, these are the people you should tell about it first, they’re the most likely group to attend an event that you’re hosting. Networking groups are a great place to get the word out about your event. The purpose of networking groups is to help promote fellow local businesses and build a support system for the professionals who meet at each group. Even if you’re not a member and want to check out a group for the first time, you’ll quickly find that you’re among friends. Not only are you reaching out to a group of fellow professionals who may attend your event, they’ll likely share your event with others they know. Make sure to tell everybody where they could RSVP, register or buy tickets to your event. Designing a flyer with the name, date, time, location and any fee to attend as well as a link to where they could respond. Consider using a Shortcode generator so you can track how many people have visited your event’s page. Follow-up is just as important as inviting someone to your event! After your event, don’t forget to follow-up with as many of those who attended as you can. Make sure you’ve thanked each of them for coming you your event and give them a clear next step to take such as setting up a one on one meeting or joining your mailing list. Stay in touch with those who attended your event, invite them to other events you both host and attend such as networking groups and meetups. For help promoting your next event, download our free event planning guide here.